Sessility is the biological property of an organism describing its lack of a means of self-locomotion. Absent natural motility sessile organisms are normally immobile. This is distinct from the botanical meaning of sessility, which refers to an organism or biological structure attached directly by its base without a stalk. 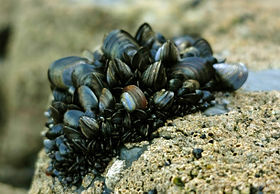 Sessile organisms can move via external forces (such as water currents), but are usually permanently attached to something. Organisms such as corals lay down their own substrate from which they grow. Other sessile organisms grow from a solid such as a rock, dead tree trunk, or a manmade object such as a buoy or ship's hull. Sessile animals typically have a motile phase in their development. Sponges have a motile larval stage, which becomes sessile at maturity. In contrast, many jellyfish develop as sessile polyps early in their life cycle. In the case of the cochineal, it is in the nymph stage (also called the crawler stage) that the cochineal disperses. The juveniles move to a feeding spot and produce long wax filaments. Later they move to the edge of the cactus pad where the wind catches the wax filaments and carries the tiny larval cochineals to a new host. Clumping is a behavior in sessile organisms, in which individuals of a particular species group closely to one another for beneficial purposes, and can be seen in coral reefs and cochineal populations. This allows for faster reproduction and better protection from predators. The circalittoral zone of coastal environments and biomes are dominated by sessile organisms such as oysters. Carbonate platforms grow due to the buildup of skeletal remains of sessile organisms, usually microorganisms, which induce carbonate precipitation through their metabolism. In anatomy and botany, sessility refers to an organism or biological structure that has no peduncle or stalk. See peduncle (anatomy), peduncle (botany) and sessility (botany). A sessile structure has no stalk. ^ Pechenik, Jan (2016). Biology of the Invertebrates. ISBN 9781497006515. ^ James H. Thorp; Alan P. Covich (2001). Ecology and Classification of North American Freshwater Invertebrates. Academic Press. p. 213. ISBN 0-12-690647-5.